I finally met Author Sawyer Bennett’s alter ego, Juliette Poe, and oh was this a different side of Sawyer! 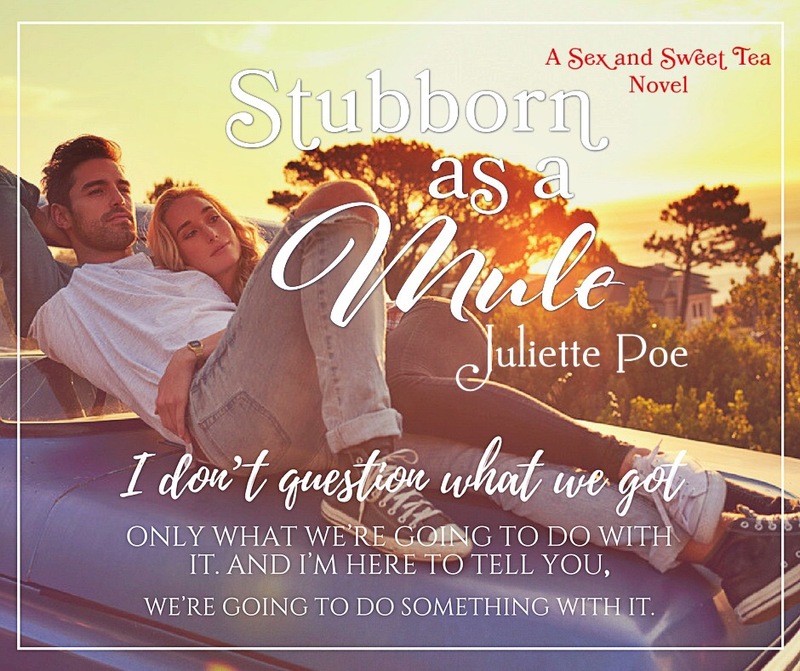 Where Sawyer Bennett’s books are hot and heated, Juliette Poe’s are more sensual, soft, and slow. 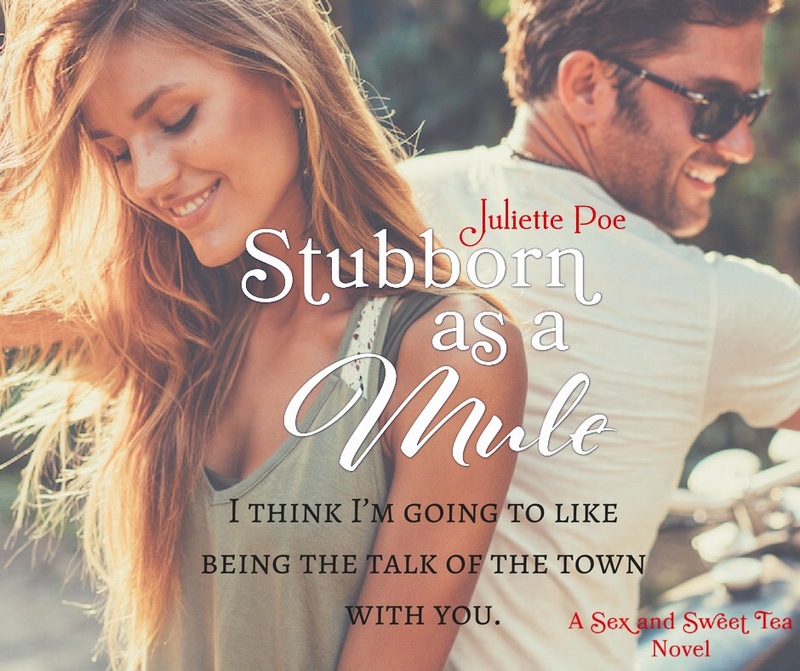 Juliette Poe’s latest sensation transports you to the sweet, small-town South where tradition, history, grace, manners, and more rule. 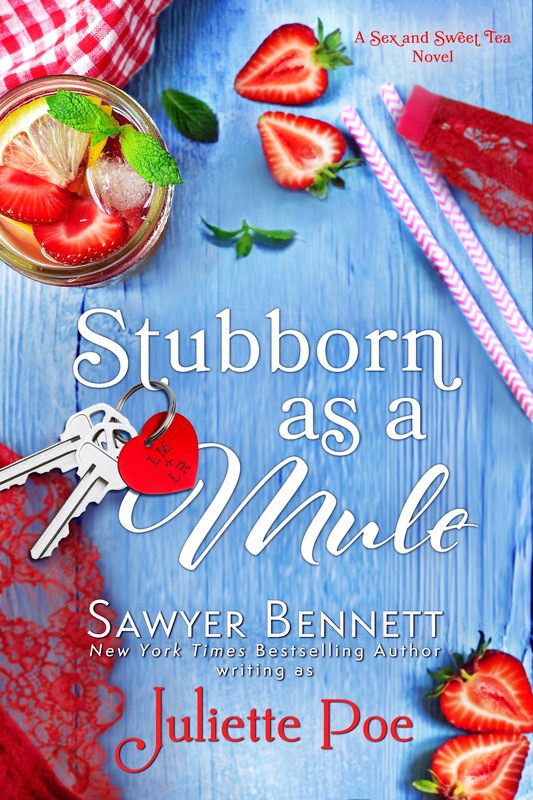 Stubborn as a Mule is SASSY and SWEET SOUTHERN GOODNESS!!! Beautiful Meli is a wealthy New Yorker relocates to a small North Carolina town to chase down her past and slow down her life. I loved her smartness and sass! 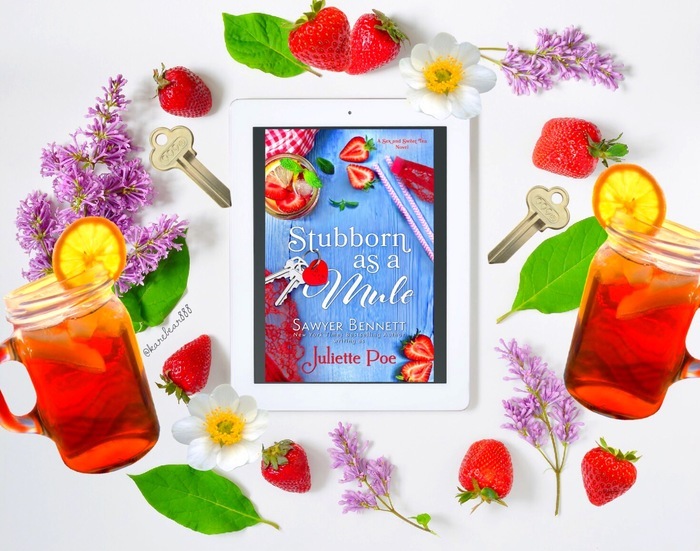 Meli never thought she’d encounter a roadblock and very unwelcoming party in the form of hot, Southern man candy, Lowe. I could not help but chuckle at their heated and humorous banter. 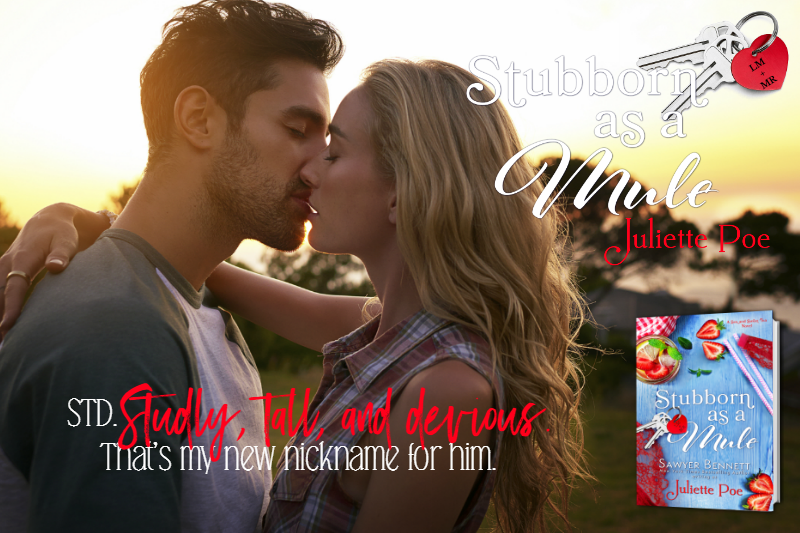 Meli and Lowe are Yankee ice meets Southern heat who MELT together! What’s not to like about a man who shuts a woman up with his lips? These opposites can’t help but attract, and oh did connection ignite like fireworks! Lowe, this Southern gentleman, made me both blush and swoon! I LOVED Lowe!!! I could not help but read his lines with a Southern accent, one way stronger than my slight one. The booming sound coming from downstairs causes me to sit straight up on the mattress that is placed in the middle of the master bedroom floor. I’ve yet to get a good night’s sleep because there’s a damn train that runs parallel to the town. It’s just two blocks over from the Mainer House, and it feels the need to blow its whistle around two AM each morning. This isn’t that big of a deal to most of the residents of the small town of Whynot, but to me… it chafes just a little because, well… I love my sleep. I’ve been assured by the nice lady who runs Sweet Cakes, the bakery right across the street from Mainer House, that I’ll get used to it, but I seriously doubt it. Even the noise of New York City never penetrated my sleep the way a train whistle does, and I get a totally empathetic look from her when I stagger in for some coffee and a cheese Danish each morning. I think I’ve slipped into a pattern at night where I now anticipate being woken up by that stupid train, so I’m not even able to get into good REM sleep. It’s probably why I shot straight up in bed at the banging that’s going on downstairs, although I can’t quite pinpoint from where it’s coming. A glance at the alarm clock sitting on the floor shows it’s 5:30 AM. It’s still dark outside, and I’m slightly—okay, greatly—confused. I struggle to process since it’s been almost two weeks since I came to Whynot and I’ve not had a decent night’s sleep since then. Then it penetrates… someone’s at my front door. Immediate anger flows through my veins, heating me up from within. Without any further consternation, I know it’s Lowe Mancinkus causing all that noise. It must be him because there’s no one else in the entire world who has ever been such a thorn in my side. Flipping the blanket back, I roll off the mattress and wince as my knees hit the floor. Almost three decades of sleeping on a mattress, box spring, and a frame, and I can’t get used to being only a few inches off the floor. I’ve held off on buying any furniture for the house until the remodeling is complete. Pushing first to my hands and knees, I manage to lurch upright and stagger out of the bedroom. Down the rotund, sweeping staircase to the main floor. I don’t even bother to look out the leaded glass panels on either side of the heavy wooden door—so convinced I am that it’s Lowe on the other side—that I fling it open without an ounce of worry. “What in the holy hell are you doing?” I snarl as the breeze generated from the doorway swinging open so fast actually blows my hair back. Lowe stands there in mid-bang, fist raised high and a diabolical glitter to his eyes. His eyes lock onto mine for just a moment before they drop and casually run down the length of my frame. I look down at myself and cringe as I realize I’m still in my pajamas, which in the sweltering South consists of a cotton tank top and sleep shorts that are really short. My hand falls from the doorknob, and I cross my arms over my chest as Lowe looks back up at me. And why does he have to be so damned gorgeous? In ordinary circumstances, this man pushes all my girlie buttons. Tall, just enough muscle to be strong but not freakish, and that dark chocolate hair with bright hazel eyes that are every woman’s fantasy. I always have to remind myself he’s a nasty SOB who I wouldn’t give the time of day to… in ordinary circumstances, that is. “I’m here to start work,” he says casually as he pushes past me into the main foyer. “It’s five-freaking-thirty in the morning,” I grit out, not moving from the open doorway. I expect him to be walking right back out again. “Get some decent clothes on, and I wouldn’t be forced to look through your cupboards for nonexistent coffee,” he replies calmly, moving onto the next cabinet even though I’ve told him I have no coffee. In fact, I have hardly anything at all here. A mattress, pillow, sheets, and blanket in the bedroom, some orange juice in the fridge, and towels in the master bathroom. Those are the only creature comforts at this point, and they’re enough to get me through the remodeling. I’ve been eating out almost every meal and this is not a hardship as that’s pretty much what I do when I’m back home in New York. One, however, can only eat so many grits and collards, although I’ll take them over fatback and pickled pigs feet any day.